Concrete that was removed from the existing buildings that were demolished was recycled back into the project. Progress clearly moved forward in dramatic fashion when crews recently raised a 89,000 sq. ft. air supported sports dome as part of a multi-year expansion program for the Hmong College Prep Academy (HCPA) in St. Paul, Minn. Equally dramatic is the rapid growth and popularity of this state of Minnesota charter school and the aesthetic improvements it is bringing to this mostly unseen city neighborhood. Since 2004, the school has grown from 200 students to 1,600 students and cleaned up a piece of mostly unsightly and under used commercial property. RJM Construction based in Minneapolis, Minn., took on the $27 million contract. The company specializes in construction management, design-build, general contracting and pre-construction services. Project work includes the construction of a two level parking ramp along with street parking for 500 plus cars, a 116,000 sq. ft. addition for an elementary school, a new gymnasium and the conversion of the existing gymnasium to classroom space. When work is done this coming May, there will be room for 2,200 kindergarten through 12th grade students. Ironworkers recently picked the last steel beam for the three-story classroom addition that wraps around two sides of the new gymnasium as exterior construction continues. A total of 57 classrooms will be added to the school and will bring some much needed classroom and recreational space to the campus, said Paul Yang, chief operating officer for the school. This is the second time in four years RJM construction crews have been at this school. In 2013, they finished the first addition to the school. Yang is pleased to have RJM crews back. “I like working with them because they're on top of their game. They do good work and they do it in a timely manner,” Yang said. The construction of this one-year project is the fourth and last phase of the school expansion program to meet increasing capacity demand and the academic and extra-curricular activities of the rapidly growing school population. The first phase renovated the original, 7,250 sq. yd. space to one filled with classrooms. The second and third phases added a parking lot and an addition as the school continued to grow. The HCPA moved to its present location from Minneapolis in 2006. At that time, the existing building space had been vacant and a bit run down, said Yang. Before it was inhabited by students and staff, it was home to a racquet sports club and even brought a little bit of Hollywood to this location when it served as a studio for the Grumpy Old Men movie. To make room for the dome, which includes an area for track and field events, tennis courts and the parking ramp, the school bought 10 acres of rectangular property across the street from the school. In recent years, it was home to a school bus depot and diesel engine repair shop; adding a bit of incongruity to this out-of-the-way St. Paul neighborhood inhabited by two schools and large housing units. Working in reverse, the school began as a high school then began adding elementary grades to the program. Discipline and academics are key dynamics of the educational program. Though the student population is primarily Hmong, Yang emphasized the school follows the same curriculum as the public schools and accepts students of all ethnic backgrounds. The Yeadon Company, based in Minneapolis, Minn., manufactured the dome. The new gymnasium is made up of pre-cast concrete walls supplied by Wells Concrete, based in Albany, Minn.
Steel for the addition was supplied by National Steel, St. Paul, Minn.; Central Minnesota Fabricators, Willmar, Minn.; and Briese Iron Works, Rochester, Minn.
Belair Site Works, with an office in New Brighton, Minn., was the demolition and earth work contractor. 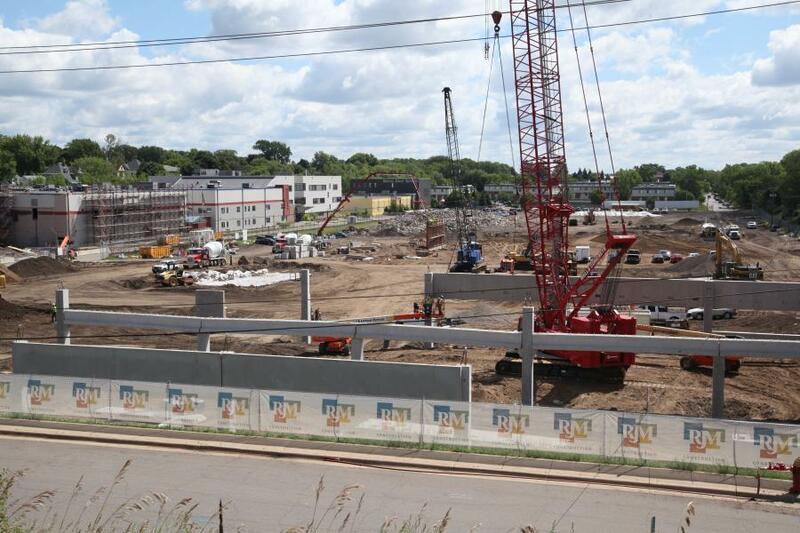 The new gymnasium and classroom building, the dome and part of the parking ramp are anchored on nearly 800 helical piers supplied by Veit Construction, Minneapolis, Minn., and Atlas Foundations, Maple Grove, Minn. Engineers relied on helical piers because of poor soil conditions throughout the construction site. At depths up to 80 ft., 234 helical piers support the dome and partially the parking ramp. The entire school addition is anchored by 450 helical piers. Wells Concrete crews rolled in a Manitowoc 999 crane to hoist the double T spans, some weighing as much as 67,800 lbs. and the pre-cast concrete panels to build the parking ramp. Across the street, they stationed a Kobelco 200-ton crawler crane for the addition construction. Lull JLG lifts surrounded the renovation of the old gymnasium and construction of the new one. 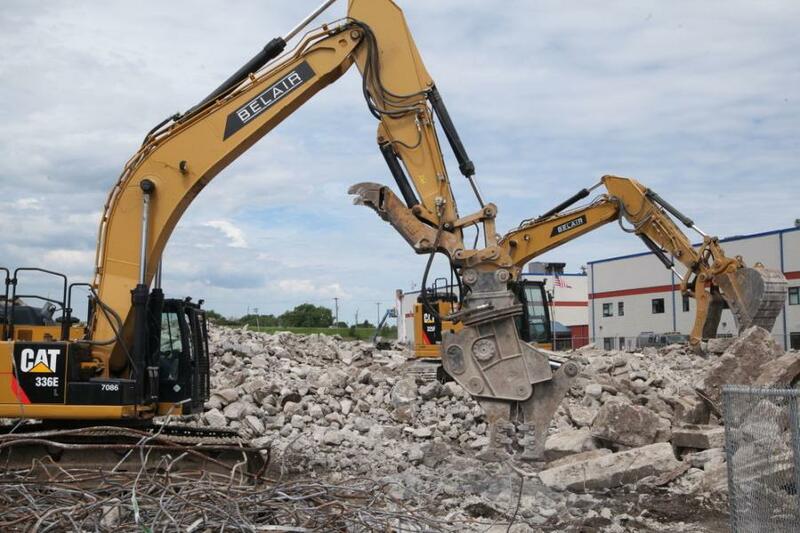 More than a dozen pieces of earth moving equipment roamed the site for demolition and excavation operations. They included Cat and Volvo excavators, dozers, skid steers and a Dynapac roller. 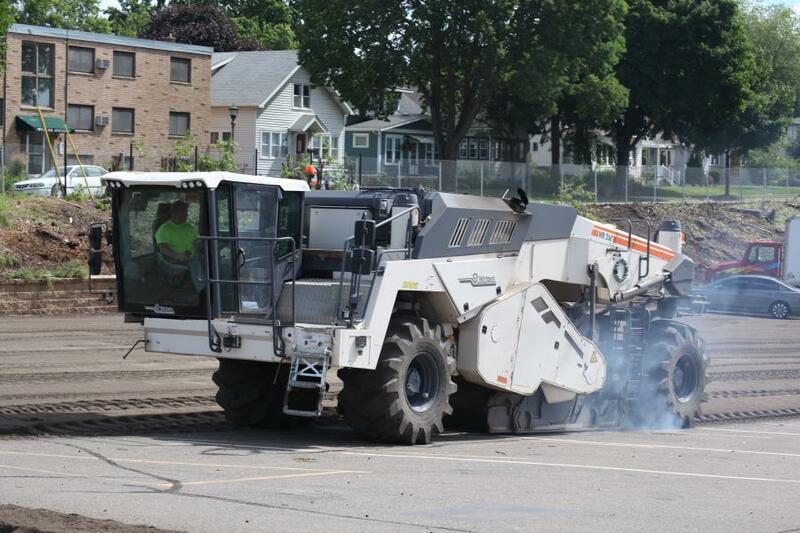 To make room for the new gymnasium, Belair crews trucked in a Wirtgen 300S WR250 milling machine to strip the asphalt parking lot and recycle the material back into the project. Other quantities include 1,170 tons of steel for the school addition, 3,840 cu. yds. of concrete and 137 tons of rebar. Belair crews dug and moved 77,750 cu yd (59,500 cu m) of soil. During construction, crews faced tight deadlines. The conversion of the old gymnasium to classrooms had a 60-day deadline and the two story parking ramp had to be completed by the opening day of the Minnesota State Fair. Seigley juggled the schedules of dozens of sub-contractors, including three different steel suppliers and two erector companies. The school campus sits near the main entrance to the Minnesota State Fair which draws nearly 200,000 visitors daily for 12 days to the neighborhoods around the fairgrounds. Tucked below a hill side of a residential neighborhood near the fairgrounds, it is hemmed in on the north side at the base of the hill, by Snelling Avenue, a high volume four lane city arterial on the west side and busy railroad tracks to the south. The east side of the school property borders high density housing of several large apartment buildings. Work began in May with the demolition of existing buildings and excavation operations at the site of the future sports dome and parking ramp. Similar to the underground discoveries made during the third phase of the school expansion program, the most recent excavation operations point to an early to mid-20th century past of this part of the city being home to auto repair shops and fueling stations. Pre-construction bore samplings showed the underground soil laced with petroleum based contaminates. 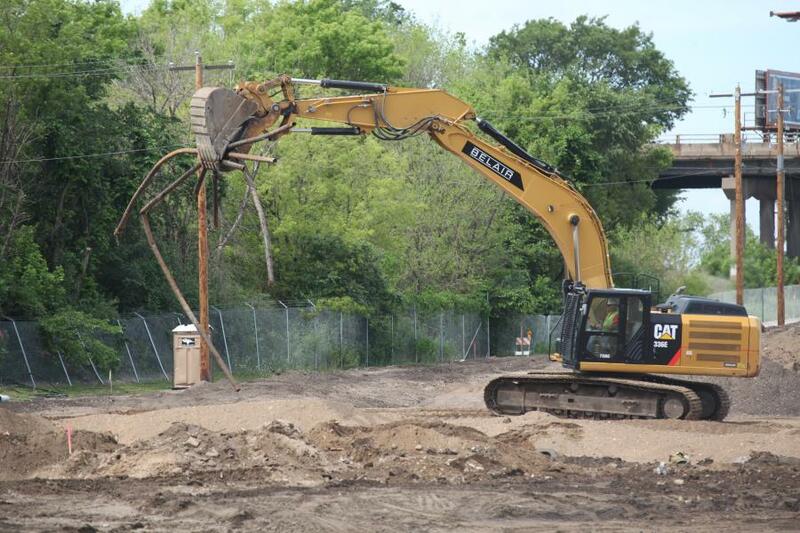 When excavation began, excavator operators uncovered a graveyard of industrial artifacts and car frames, said Mike Seigley, RJM Construction superintendent. Below the old parking lot at the site of the new gymnasium, crews removed an underground foundation and a couple of fuel tanks. Demolition crews hit a slow-down, Siegley said, when they discovered asbestos roof paint on the the roofs of the buildings coming down. The gymnasium renovation included the removal of the old gym floor, replacement of a roof truss with steel beams, new windows and interior finishes. 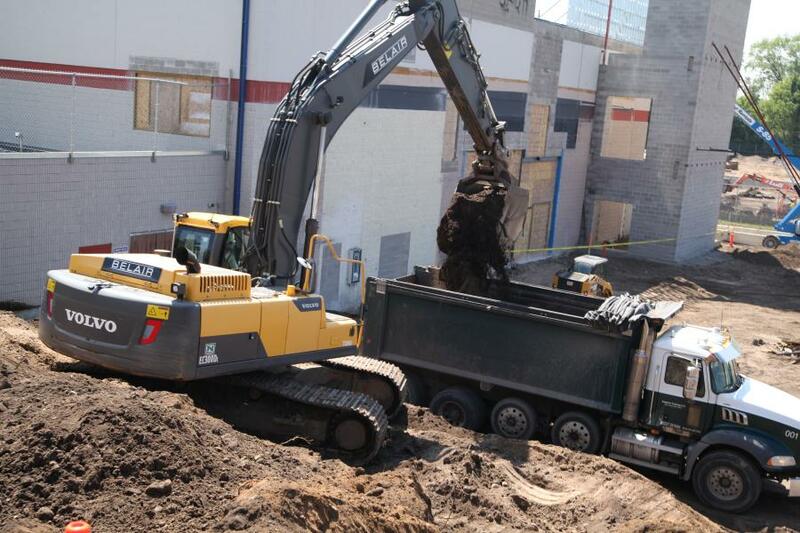 As demolition and construction stretched into the beginning of the 2017 summer break, crews took over the parking lot used for school bus staging and began digging into the soil there to build the new gymnasium and classroom addition. Because the base of the addition sits at the bottom of the slope coming down from the north side of the construction site and tapers down from 20 ft. to 8 ft., a retaining wall was required. “It was a little tricky installing that wall. We had to extend it to the street above to accommodate the grade,” Seigley said. Work to raise the dome in early November was a labor intensive project. “It took roughly 50 people working double shifts over the course of two days to get it inflated. Once the fabric is laid down and in place, workers tuck the bottom edge into a channel ring circling around the base of the dome. Then the exterior cables are tied across the fabric before it can be inflated,” Seigley said. As work heads into the new year and the cold winter months, all of the heavy, exterior work is nearly completed while crews move into the interior phase of the building addition. Crews recently started pouring the floors and installing the exterior skin shooting, “to get the building enclosed by mid-January,” Seigley said. The peak work force of 100 people is now dwindling and most of the heavy construction has been completed. Ironworkers are finishing the detail work on the steel skeleton for the addition as the siding begins to be installed. All of the remaining construction including the interior plumbing, electrical and finishing work will be completed in May 2018. When students return from the 2018 summer vacation break, they will return to a larger, more spacious school with up to the date outdoor and indoor recreational facilities.